In this week’s Billions episode entitled, The Good Life, U.S. Attorney Chuck Rhoades is ready to go after Axe Capital. We are taking a look at how that transpires despite a conflict of interest and lack of recusal. After Peter Decker’s deposition (in last week’s episode), Rhoades learns about a farmer that gave Axe Capital employee, “Dollar Bill,” some insider information on Pepsom Pharmaceuticals. When the U.S. Attorney’s office is preparing to head to Iowa to talk to the farmer, Bryan Connerty, Rhoades’ point man, suggests Rhoades may want to recuse himself from this case due to a conflict of interest (namely, his wife’s employment as Axe Capital has stopped him from pursuing action against the firm). Rhoades is indignant that Connerty would even ask this question, dismisses him, and heads to Iowa where he quickly undermines the farmer and gets him to sign a statement saying he gave up insider information to Dollar Bill. Upon Rhoades’ return to New York, he is tipped off by a reporter that Axe Capital is dumping all of their stocks, whereupon he calls his wife Wendy and tries to casually confirm. Later in the episode when Rhoades’ team is getting ready for their raid and subsequent arrest of Dollar Bill at Axe Capital, Rhoades calls his wife to make sure she wasn’t there. 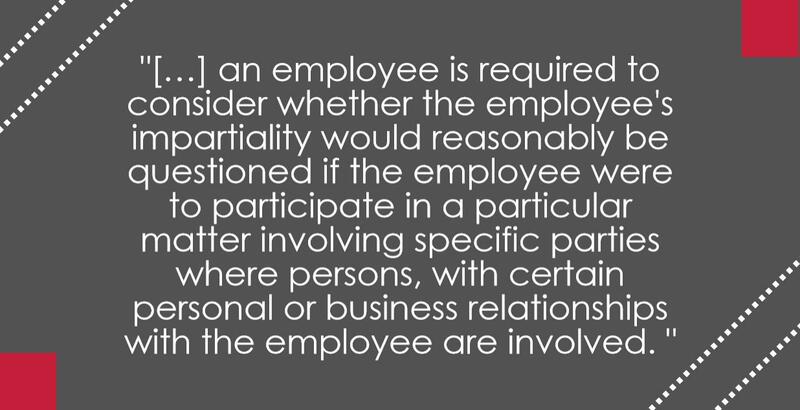 […] an employee is required to consider whether the employee's impartiality would reasonably be questioned if the employee were to participate in a particular matter involving specific parties where persons, with certain personal or business relationships with the employee are involved. If the employee determines that a reasonable person would question the employee's impartiality, or if the agency determines that there is an appearance concern, then the employee should not participate in the matter unless he or she has informed the agency designee of the appearance question and received authorization from the agency. Otherwise an employee "shall not participate" in the matter as provided under 5 C.F.R. § 2635.502(e). Adherence to the regulation is accomplished by not participating in the particular matter involving specific parties. Based on this, Rhoades should not have participated as lead counsel in this matter as a conflict of interest exists which would cause him to recuse himself. Now, he risks compromising the entire Axe Capital case that he has been working so hard to build. Conflicts of interest, such as these, are present in all businesses. How a firm reacts – to eliminate or eliminate the conflict – is essential, particularly in the financial industry. If you have questions on how to identify and mitigate conflicts of interest at your firm, contact Jacko Law Group, PC at 619.298.2880 or info@jackolawgroup.com.